The Monster Seat Back Bag is designed for carrying lots of stuff on the back of a wheelchair or scooter. This huge, rigid frame seat back bag is ideal for shopping, laundry, groceries, and more.The Monster Seat Back Bag has a rigid frame that keep the bag opened and a cover for keeping items secure. Side compartments provide quick access to items that are needed quickly. 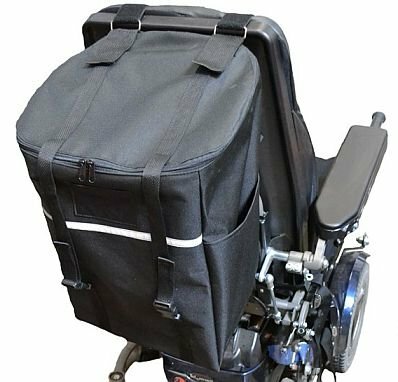 This seat back bag fits both wheelchairs with push handles and scooter style chairs. The adjustable straps convert to fit scooter seat backs and wheelchair push handles.Monster Seat Back Bag Features:Large bag for shopping, laundry, groceries, and more.Rigid frame and covered top keeps items secured.Monster Seat Back Bag Specifications:Construction: High quality water-resistant fabric with durable nylon webbing straps.Measures: 13 inches wide, 18 inches high, 10 inches deep.Made in: U.S.A. If you have any questions about this product by Diestco, contact us by completing and submitting the form below. If you are looking for a specif part number, please include it with your message.